UI Program Associate and Coach at Jordan, Camila Giraldo, shares some highlights and special moments from the day. 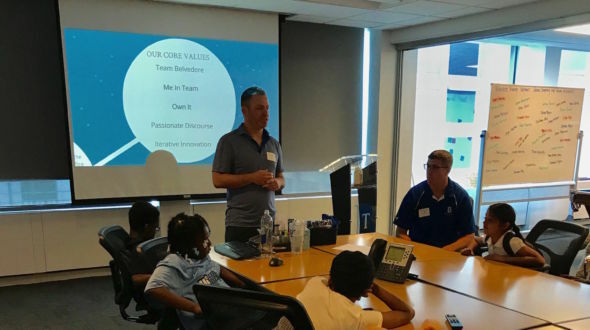 On Thursday June 8th, Belvedere Trading LLC hosted UI’s Work to Play team from Jordan Elementary. After a long bus ride from Chicago’s Rogers Park neighborhood, we arrived downtown. The kids were very excited to cross the river on the bus and see all skyscrapers. Another exciting moment came minutes after as each kid entered the building through the gold revolving doors – we had a hard time getting them to move on to the elevator they were having so much fun! 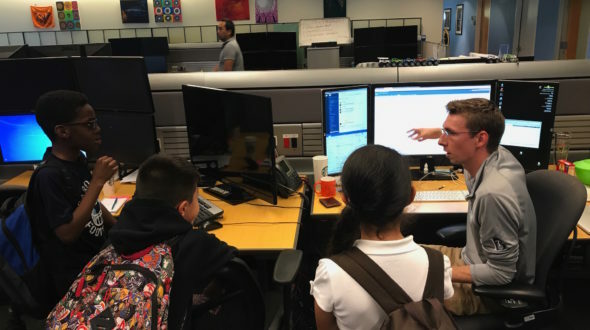 An enthusiastic team of Belvedere employees welcomed the kids to the Belvedere offices, and guided them to the “conference room,” which prompted many puzzling faces as the room included a foosball table, video game system, pool table, and games! 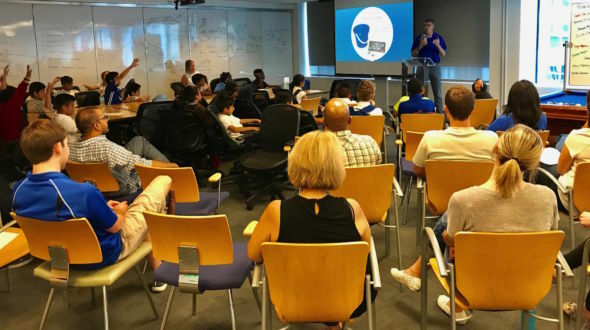 Belvedere President, Owner and Head Coach Tom Hutchinson kicked things off with an enlightening overview of a few of Team Belvedere’s Core Values, and how they directly correlate to what Team Jordan practices through UI programming: 1. Make those around you better 2. Be the best teammate 3. Work hard and have fun 4. Speak directly and openly with compassion 5. Dream big, and don’t be afraid of failure 6. Contribute outside of your role..just to name a few. Charlie Jacobson from Team Belvedere then led a compelling lesson on trading, and explained how trading is a lot like trading Pokemon cards on the playground. After the next activity of trying to guess how many M&M’s were in a jar as an analogy for their work, the students were split up into groups to go explore the office. They all thought it was really “cool” that some people had more than 1 computer- some up 8 or 9! After the tours, we came back to the original room for some Lou Malnati’s pizza and other treats. After a couple bites, they immediately started to play some foosball and pool with the Belvedere volunteers. To conclude the trip, everyone got belvedere sunglasses, and headed out through the “awesome” gold revolving doors before getting back on the bus. “It was very rewarding to see the kids get excited about trading and find a way to relate what we do everyday at Belvedere to their own lives. What a great opportunity to spend some time with tomorrow’s leaders!” said Belvedere employee Charlie Jacobson. It was truly an amazing afternoon of exploration, learning, and an incredible amount of fun. We cannot thank Team Belvedere enough for hosting and opening up their offices, and providing Team Jordan such a memorable and enjoyable afternoon!